I love these old behind the scenes race photos. My uncle's old pulling truck from back in the 80s I believe. Truck was big block powered, and I believe they solid mounted the rear end to the frame before they bobbed the rear of it. Could that be a white Oldsmobile on the line ahead of the Buick? Yes - Fremont built Buick, Olds and Pontiac, all down the same line. Any idea how they moved the rear fenders back? Cut, swap around and weld back I suppose? Looks like pretty good work. Sort of reminds me of one those 70s F#*D camper specials. I'm not sure if they moved the fenders back or if it was a long wheel base truck they cut right behind the axle, so it just appears longer. I'll have to ask next time there's a family get together. 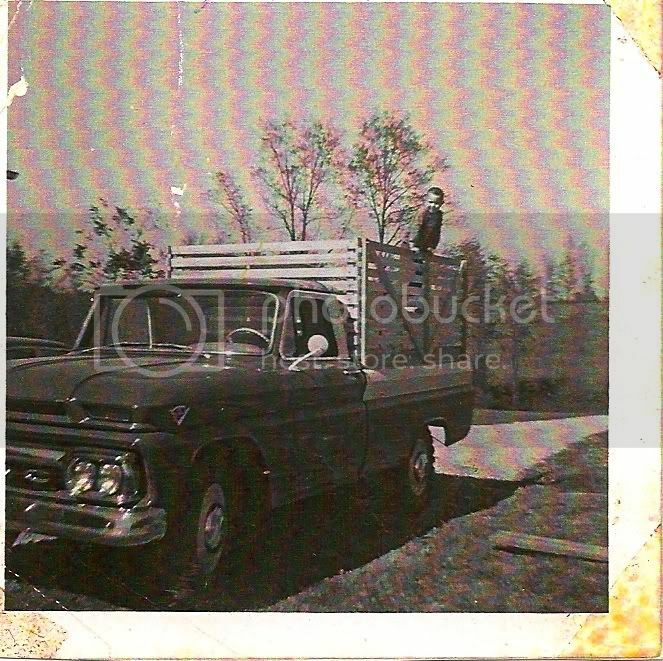 I found a couple of family photos that have my 60 Burb in it with the first two being mid to late 60's and the 3rd is around 1970-1972ish. I am constantly looking for pictures with the Burb in it. i love being a 2nd Generation first owner. ^ So, are the people in the photos you and your grandparents? Amazing picture of those GMC trucks! So.. The picture with the Ford in the foreground has my mom in the background and my father standing outside the Ford. I am not sure if that is my grandfather in the Ford. It looks like his cowboy hat and partial facial. 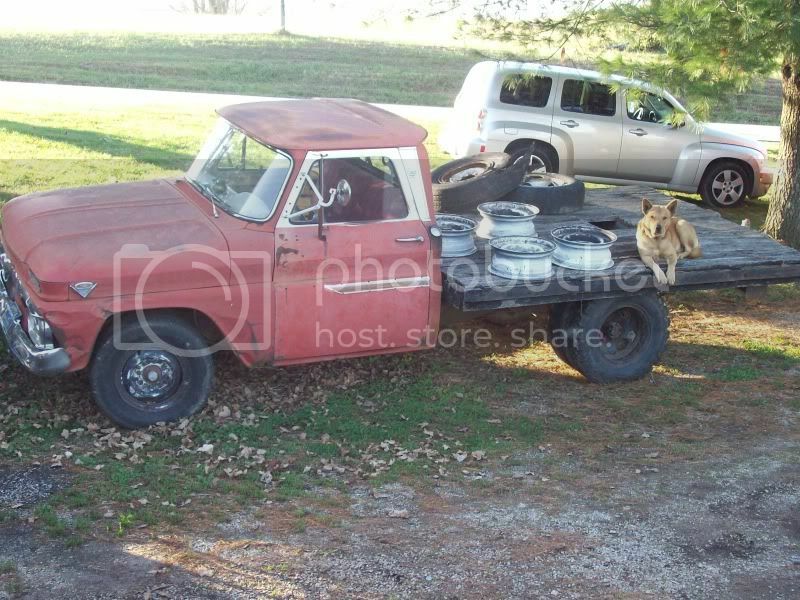 In the photo showing the rear of the Burb with the door open kinda confuses me. It is my mom to the left and I believe that I am standing there with maybe my older brother leaning in the Burb due to the height of the person. We didnt move into that house until 1969 and that fender on the right looks like my brother's 66 Polara which gives me the date of around 1973ish. I am just confused as to who the little duck in a cowboy hat is that is next to me.. My younger brother would have been approximately 8-9 yrs old ..
And.. I totaled that 68 Buick Skylark to the left in 1977..
Nice photo I found. Love the colors. * 60-66 Chevy and GMC FACTORY PHOTOGRAPHY (scans) of pickups and carryalls. I desperately need to get some factory hubcaps for my long stepper. If you've ever been in the middle east like Dubai, the ports have thousands and thousands of new American cars/trucks all the same color sitting there. I guess if your a member of the imerate you can just go and pick one up when your ash tray gets full. I couldn't see a '60-'66 C10 in there anywhere though. Is one hiding someplace? Wow. There must have been a story behind that. My great grandfather bought in new in 64. Was a 3/4 ton. 305 v6, sm420. My great uncle had it and sold it sometime in the 80's. My dad found it in 2005 and bought it for $300. It had been sitting at a warehouse and they'd throw cans in the back and haul them off every few months. Started instantly, ran smooth but had mismatched height tires on back, that were bald. We keep it on the farm for a while, I drove it to high school once. Back brakes are sticking and the carb needs rebuilt now. I've finally fount some one piece rims and have pulled the carb off. Ill start taking more pictures from here on out. Dig that old shot. The appearance of seldom seen 19.5's on that sweet GMC are like finding a rare snap of bigfoot. Lol.